SEATTLE, February 22, 2018 – BNSF Railway Company (BNSF) today announced that its 2019 capital expenditure program in Washington will be approximately $175 million. Much of this year’s capital plan in the state will be for replacing and upgrading rail, rail ties and ballast, which are the main components for the tracks on which BNSF trains operate. Maintaining rail network infrastructure reduces the need for unscheduled service work that can slow down the BNSF rail network and reduce capacity. Over the past five years, BNSF has invested approximately $1 billion to expand and maintain its network in Washington. 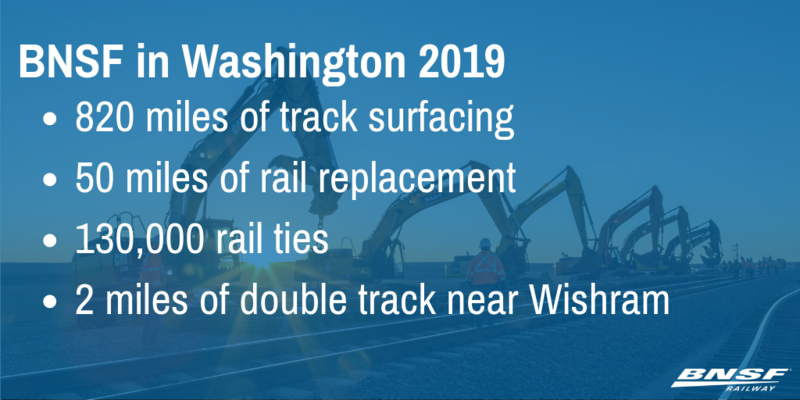 This year, the maintenance program in Washington includes approximately 820 miles of track surfacing and/or undercutting work as well as the replacement of about 50 miles of rail and close to 130,000 ties. In addition to maintenance projects, BNSF plans to install approximately two miles of new double-track along the Fallbridge Subdivision near Wishram.